It can be challenging task for coal plants, waste incinerators, and others industrial plants to control and reduce their flue gas emissions. SO₂, SO₃, HCl, HF and other acid gases are major environmental and health hazards that require treatment to meet air quality regulations. Sodimate’s custom-designed and retrofit dry sorbent injection systems can be used for all types of dry and semi-wet reagents used for emission control. The turnkey storage, discharge and feed systems are most commonly used for Calcium hydroxide (lime), sodium sesquicarbonate (Trona) and sodium bicarbonate (Soda ash) injection. Mercury abatement can also be achieved by using powdered activated carbon (PAC) injection technology. 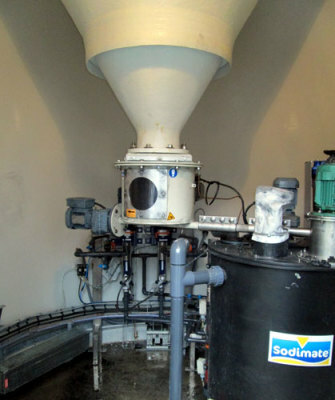 Sodimate, Inc also supplies dry-to-slurry systems for wet scrubbers as well as pneumatic transfer equipment. Rental and trial dry sorbent injection systems are also available to test different sorbents, feed rates, and injection locations.